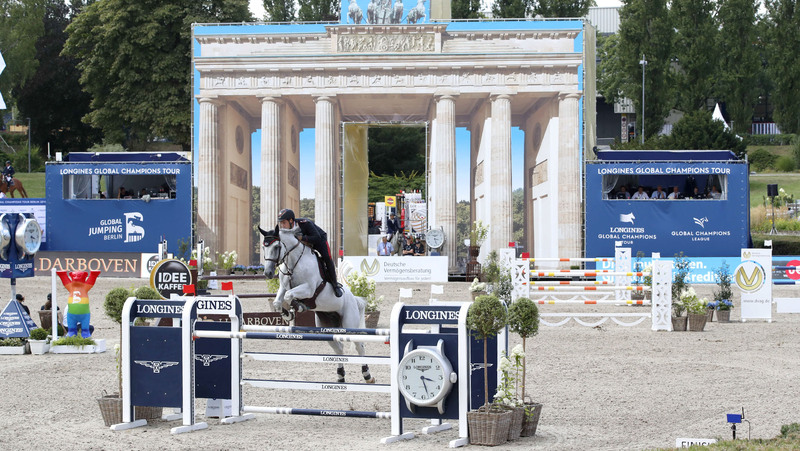 Speed merchant Emanuele Gaudiano (ITA) blazed the trail at the opening CSI5* competition at the Longines Global Champion Tour of Berlin, taking the win with his huge striding gelding Caspar. Gaudiano took the Preis der Familie Eduard Winter trophy ahead of three-time Olympic gold medallist in Eventing Michael Jung (GER) and Martin Fuchs (SUI) who claimed third spot. A beaming Gaudiano said: “Today I rode Caspar a little faster, and we won! I was at the end of the [start list], but as you saw with Michael Jung, he was very fast - he tried to catch me but he was just a bit slower than me." Frank Rothenberger put together a solid course for the first class of the LGCT Berlin, with the long oval arena a unique set up on the 16-event Championship race which sees riders and horses visiting galloping grass fields, and small, accurate sand arenas. The course was a fair test for the international field, including a DKB oxer, and a light-to-touch IDEE Cafe vertical, as well as a Sapinda vertical which tumbled from its shallow cups. One of the early riders to go, Rolf-Göran Bengtsson (SWE), lead the way for much of the early part of the competition, putting in a time of 32.91s with Crunch 3, far ahead of the rest of the field by a good two seconds and putting the pressure on those behind him. However, the local fans who packed the shaded grandstands had hopes raised after home rider Felix Hassmann (GER) quickly powered to the top of the leaderboard with Balance, shaving off almost three seconds from Rolf-Göran Bengtsson’s time to set a new time to beat of 30.20s. Geir Gulliksen (NOR) with Exit of Ice Z put in a strong round, but couldn’t better the German’s time, slipping in just behind in 31.23s. Temperatures were raised after Constant van Paesschen (BEL) flew around the second phase with black stallion Vendetta Treize, shaving yet almost another second off the time to go below 30s, stopping the clock in 29.29s to take over the lead and looking strong for another CSI5* win. Plenty of German riders looked on form in the opening class, with clears from Ludger Beerbaum (GER) with Cool Down, Holger Wulschner (GER) with Zuckersuess d’Argilla, Harm Lahde (GER) with Oak Grove's Vogelfrei, Markus Brinkmann (GER) with Pikeur Quick Fire, Marcus Ehning (GER) with Comme il Faut and Daniel Deusser (GER) with Calisto Blue all on a score of zero. But Emanuele Gaudiano (ITA) with Caspar 232 soon better van Paesschen’s time, galloping to the first three fences and shaving off milliseconds 27.74s. Martin Fuchs (SUI) with Chica B Z put in a valiant attempt but couldn’t better the Italian’s time, slotting in behind in 28.55s. Final rider to go, three-time Olympic gold medallist in Eventing Michael Jung (GER) flew around the arena with fischerChelsea, the crowd on the edge of their seats as their local hero galloped to the final fence. But they couldn’t quite match Gaudiano, settling for second in 27.83s. So speed demon Gaudiano would take the first win of the weekend, with the GCL Berlin first round kicking off next at 17:20 local time. Tune in via GC TV and on the official FB Live page to watch the action as it unfolds.